Looking for support to continue your practice after taking one of our courses? Join our weekly online drop-in mindfulness group led by Mindfulness Northwest teachers. Our highly trained Mindfulness Northwest teaching staff. We'll use the Zoom video conferencing platform. Find out more about this easy to use software at www.Zoom.us. Broadband internet is required. Details on how to use Zoom will be sent with your RSVP or monthly subscription confirmation. You may attend one session for free to ascertain suitability. To receive information on how to connect to the weekly session, please Register using the no-cost RSVP option. Please don't hesitate to email or call us (360-830-6439 ext 0) with any questions. A silent day of continuous practice will take place at the beautiful Peace and Spirituality Center of St. Mary-on-the-Lake, on the shores of Lake Washington. This nine-acre site offers wooded paths, mountain views, a dock on the lake and spacious, modern rooms; we'll be well-cared-for and can relax into the pace and rhythm of this day of practice together. 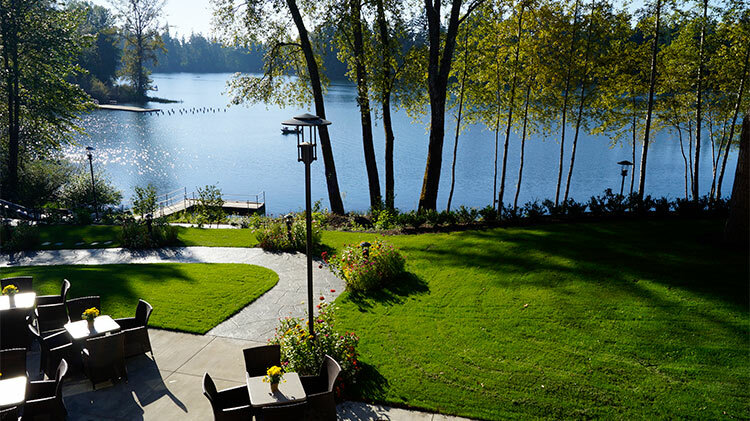 The retreat is designed especially for those who have taken Mindfulness Northwest classes. A day to gather, see old friends, and reinvigorate our practice together. Others with teacher-led meditation experience or a background in contemplative practice are invited to join as well. If you are totally new to meditation this day may be a challenge but you're welcome to inquire; and, for some, "jumping in" is a great way to start. Instructors: Richard Johnson, PhD, Mindfulness Northwest Senior Instructor and Teresa Johnson, Mindfulness Northwest instructor. Cost: $55 - $100 Sliding Scale Tuition. Payment plans are also available during registration (four equal monthly payments; no financing fee). A day of immersion into mindfulness, stress reduction, and body awareness. Formal practices including body scan, mindful yoga, sitting and walking meditation, all practiced together in silence. Please see the MBSR page to review details about the Mindfulness-Based Stress Reduction program. This Day of Mindfulness is based on the MBSR principles and practices. MBSR is a well-researched class designed by Jon Kabat-Zinn and the Center for Mindfulness at the Univ. of Massachusetts. It has proven very effective in helping with many stress-related issues. A silent day of continuous practice at the beautiful Brightwater Environmental Education Center. A silent day of continuous practice in Woodinville at the beautiful Brightwater Environmental Education and Community Center. This new facility, situated on the edge of a hill with spacious views across the valley, is located roughly 20-25 minutes from Bellevue. During this day-long retreat, we will be guided in a sequence of meditation and mindfulness practices including: sitting meditation, the body scan, walking meditation (indoors and out! ), gentle mindful yoga, and contemplative practices like the loving-kindness meditation. Beth Glosten, MD, Certified Mindfulness Teacher through the Mindfulness Northwest Teacher Training Program. During this day-long silent retreat we will be guided in a sequence of meditation and mindfulness practices including: sitting meditation, the body scan, walking meditation (indoors and out! ), gentle mindful yoga, and contemplative practices like the loving-kindness meditation. Instructor: Karen Schwisow, E-RYT, Mindfulness Northwest Senior Instructor. Karen is certified to teach MBSR by the Center for Mindfulness at the University of Massachusetts. Instructors: Richard Johnson, PhD, Mindfulness Northwest Senior Instructor and Trained MSC Teacher qualified to teach MSC by the Center for Mindful Self-Compassion. Catherine Duffy, Mindfulness Northwest Instructor and MSC Trained Teacher by the Center for Mindful Self-Compassion. Cost: $55 - $100 Sliding Scale Tuition. A silent day of continuous practice at the gorgeous Semiahmoo County Park Cannery Lodge north of Bellingham - a very beautiful and peaceful location for practice on the spit surrounding Drayton Harbor, across from Blaine. We'll practice together inside their historic Cannery Lodge, with options for walking meditation and lunch break time outside on the water. We hope you'll join us in this accessible new Mindfulness Northwest class designed by our Executive Director Tim Burnett based on his 30 years of meditation experience and teaching hundreds of students mindfulness and compassion. Catherine Duffy, Certified Mindfulness Teacher through the Mindfulness Northwest Teacher Training Program and Teacher in Training with the Center for Mindful Self-Compassion. Cost: $95-$145 Sliding Scale Tuition. We also have special Scholarship Tuition options available for those unable to pay at the low end of the sliding scale. Payment plans are also available during registration (four equal monthly payments; no financing fee). NOTE: King County employees are eligible for free tuition via the King County Balanced You program. To sign-up for this course, please email BalancedYou@kingcounty.gov to request approval before registering on this website. Neuroscience has proven what people intuitively know — human beings need connection: we’re neurologically wired for it and psychologically dependent on it to thrive. This innate need and capacity requires early, consistent experiences with attuned and secure parents in order to develop. Research tells us, however, that 45% of all adults in the U.S. have not experienced the kind of parenting that provides the foundation for the neurological patterning of lifelong feelings of safety, security, and well-being, the underpinnings of healthy adult relationships. Cost: $30 - $60 Sliding Scale Tuition. Payment plans are also available during registration (four equal monthly payments; no financing fee). Learn the healing art of mindfulness in this well-respected class. 26 CE credits also available if you're a healthcare professional. Are you interested in mindfulness and its potential for enhancing health and well being? Are you under stress? Are you struggling with chronic conditions such as chronic pain, depression, and anxiety? Are you feeling as if life is too much? Or do you simply want to live a fuller life with greater balance? Recent research shows Mindfulness-Based Stress Reduction (MBSR) reduces chronic pain and boosts the immune system; addresses painful mental states like depression and anxiety; minimizes emotional reactivity and promotes well-being; increases flexible attention and sharpens mental focus; and actually thickens grey matter in the areas of empathy and problem-solving. the Mindfulness Northwest Teacher Training Program. $340-$520 Sliding Scale Tuition. We also have special Scholarship Tuition options available for those unable to pay at the low end of the sliding scale. Payment plans are also available during registration (four equal monthly payments; no financing fee). Up to 26 CE credits are available for an additional $95 fee. Please see "Continuing Education Credits" below. or register by phone at 360-830-6439 ext 0. Cancellation Policy: For all details about our registration and cancellation policies, please see our Course Registration Policies page. See our entire schedule of classes, workshops, and retreats. Or to sign up for our MBSR 5-day Residential Intensive Training Retreat coming in August click here. This workshop will give you a taste of mindfulness training and is based on the 8-week Mindfulness-Based Stress Reduction (MBSR) program. MBSR has been shown to reduce chronic pain and boost the immune system; address painful mental states like depression and anxiety; minimize emotional reactivity and promote well-being; increase flexible attention and sharpen mental focus. Group dialogue and small group discussion. Suggestions on resources for ongoing practice and how to apply mindfulness at work. Please see the MBSR page for full details about the well-researched class designed by Jon Kabat-Zinn and the Center for Mindfulness at the U. Mass Medical Center which this course is based on. Instructor: Catherine Duffy, Mindfulness Northwest Instructor and MSC Trained Teacher with the Center for Mindful Self-Compassion. Instructors: Karen Schwisow, E-RYT, Mindfulness Northwest Senior Instructor. Karen is certified to teach MBSR by the Center for Mindfulness at the University of Massachusetts. Join us for a full week-long retreat of mindfulness practices in the style of Mindfulness-Based Stress Reduction (MBSR) at a beautiful retreat site on Samish Island in the Samish River delta of Skagit County in Washington state (roughly 90 minutes north of Seattle). The retreat will be a deep exploration of the roots of mindfulness practice both experientially and through a series of talks on Buddhist teachings and connected ideas from philosophy, poetry, and the sciences. 2019 Roots of Mindfulness Theme: TBD. This residential retreat will be held mostly in silence and will include a series of gently guided mindfulness practices including sitting meditation, walking meditation, gentle yoga, and the body scan. This retreat will be highly relevant both to mindfulness students interested in deepening their practice and to teachers of mindfulness who would like to strengthen their background understanding of the Buddhist roots of MBSR. Starts Sunday, October 6th with 4 - 5 PM check-in. Closes Sunday, October 13th by 2 PM. Before practicing for a full week we recommend that you have experience with mindfulness or related contemplative practices. The retreat is designed first for graduates of the intensive 8-week Mindfulness-Based Stress Reduction class and should also be fine for those who have tasted mindfulness or meditation in teacher-led classes, retreats, or meditation centers. Contact us if you have questions about whether this retreat will be appropriate for you. This course meets the prerequisites for those in the the Center for Mindfulness' Oasis training pathway. See the CFM website for more information. It meets CFM's requirement to attend an annual, silent, teacher-led retreat of at least 7 days for ongoing development and one of the 4 required retreats before certification as an MBSR teacher. This retreat also meets requirements for training as a Mindful Self-Compassion teacher which requires a 5-day silent retreat before beginning Teacher Training (see the Center for Mindful Self-Compassion website for details). $890 - $1290 Sliding Scale Tuition. We also have special Scholarship Tuition options available for those unable to pay at the low end of the sliding scale. Food, lodging, and teachings are included in our all-inclusive registration fees. There is an additional surcharge ($15 - $30) for some lodging options (see below). Note that there will also be an opportunity on-site and during registration to practice generosity ("dana" in Buddhist ethics) by making a contribute to our Scholarship Fund so that others without means can attend. It's not really an island - you can drive there. During the registration process, you may request one of these options: rustic, e-cabin with double occupancy, or e-cabin with single occupancy, or RV or camping. The hearty meals served at Samish Island Campground get rave reviews. All meals are included in the registration price. We can accommodate nearly any dietary request - just let us know in the Comments field during registration. Join us for our annual weekend retreat of mindfulness practices in the style of Mindfulness-Based Stress Reduction at a beautiful retreat site in the Skagit Valley. This residential retreat will be held mostly in silence and will include a series of gently guided mindfulness practices including sitting meditation, walking meditation, gentle yoga, and the body scan. Informative talks on the process of being on retreat, mindfulness, stress reactivity, and other topics will be presented by the instructors. Small and large group discussion centered around our experience together walking, sitting, and breathing in the quiet of the beautiful retreat site. This course is designed for graduates of mindfulness classes - please see the prerequisites below. Simple accommodations and all meals will be included. Starts Friday with 4pm - 5pm check-in. Closes on Sunday by 2pm after lunch and camp clean-up. Before practicing for a full weekend we recommend that you have experience with mindfulness or related contemplative practices. Please contact us with any questions. Tim Burnett, Lead Teacher: Executive Director and Guiding Instructor at Mindfulness Northwest. Sliding Scale Tuition. We also have special Scholarship Tuition options available for those unable to pay at the low end of the sliding scale. Food, lodging, and teachings are included in our all-inclusive registration fees. There is an additional surcharge ($15 - $30) for some lodging options (see below). Note that there will also be an opportunity on-site and during registration to practice generosity by making a contribute to our Scholarship Fund so that others without means can attend. Samish Island Campground, 11565 Scott Road, Bow, Washington. Instructions and details will be provided when you register. Samish is about 90 minutes north of Seattle and 40 minutes south of Bellingham. Directions and more information about Samish are available here. And see also our carpooling site for setting up ride shares. A surcharge is required for lodging in the more modern e-cabins. A $15 surcharge is required for double occupancy in an e-cabin (with a single roommate), and a $30 surcharge is required for single occupancy. Consider helping us make e-cabins available to more people, and save $15, by requesting double occupancy. We will do our best to match you with a compatible roommate and to honor requests for roommates if you are coming to retreat with a friend. 1) Follow the Schedule - participate in the practice schedule as fully as possible. We allow alternate schedules and variations in the schedule due to health needs. This is a structured weekend of practice with a schedule of practices we will do together starting first thing in the morning. That structure is a powerful support for deepening our mindfulness practice. Starts Sunday, with 4 - 5 PM check-in. Closes the following Sunday, by 2 PM. See our entire schedule of classes, workshops, and retreats listed by region.